Scattered throughout eastern Jamaica’s mountainous interior are small farmers that face innumerable challenges to make a living on some of the island’s most challenging terrain. 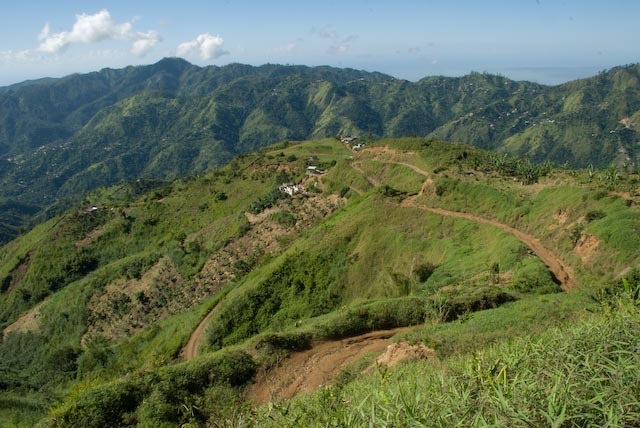 At 45 kilometres long and 20 kilometres wide, the Blue Mountain Range is one of the Caribbean’s longest continuous mountain ranges and Jamaica’s highest and largest with many of the peaks on the Grand Ridge range from 900 to 2256 metres. Many of the villages here are peopled by descendants of slaves who moved from the coastal plantations into the interior after emancipation from slavery in 1838. Crops grown include cash crops such as potatoes, bananas, carrots, tomato and yam and the world-famous coffee named for this range. The community of Halls Delight in the road from Mavis Bank to Westphalia in the Blue Mountains of St. Andrew. 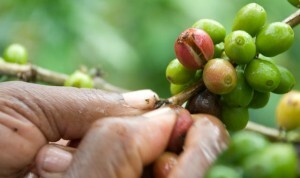 Originally introduced to Jamaica in 1725 from Martinique, commercial coffee cultivation spread to the Blue Mountains where the altitude of over one thousand metres and the cool climate resulted in coffee berries taking a longer time to mature than at lower altitudes. This resulted in the coffee’s unique flavour and led to the establishment of large coffee estates and factories, some of which still exist today. It is to these factories that small farmers sell their ripe coffee berries. Olivia Penny picks coffee berries on her son-in-law’s property in Portland in the Blue Mountains. In addition to the economic obstacles faced by farming, the residents of the Blue Mountains face many other challenges related to their geography, which were highlighted in the past decade. From 2004 to 2008, hurricanes and tropical storms resulted in landslides, the destruction of buildings and the disruption of water supplies. Much of this is exacerbated by poor farming practices on the steep and fragile slopes which led to land degradation and erosion. This has resulted in many of the communities being necessarily self-sufficient, since they cannot always rely on the authorities to rebuild roads or repair the infrastructure. 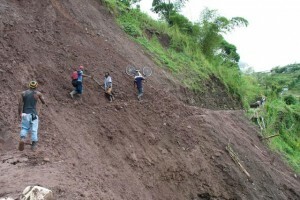 A cyclist and pedestrian make their way across one of the landslides at Cascade, Portland. After five years of neglect, this road has began to be repaired in 2010 after it occurred in 2004. Yet there is potential for other sources of income for residents of these mountains. The unique biodiversity of the Blue Mountains resulted in it forming the main component of the 76,000 hectare Blue and John Crow Mountains National Park which was established in 1993. Thus, many residents believe that the Blue Mountains have great potential for heritage and adventure tourism, but requires sustained more marketing from Jamaica’s tourism industry. If this is done the residents believe that they will not be left to the economic and environmental vagaries to which they are now subjected.